Summer is such a lazy time for me. I have been cooking, but without a real plan. My kids are going back to school next Wednesday, though, so I need to get back to planning ahead, or we will either eat out too much or starve. I have been bad at menu planning lately, and I am suffering from it. I have still been cooking most nights, but it was a much more fraught experience, with lots of indecision and angst about how I could have made a better choice. I know that there are people who can look at what they have in the house and come up with a fantastic meal on the spot, but I am not really one of them. I mean, I can do it occasionally, but it is not a skill I can rely on. I am diving back into the menu planning this week. My kids are relieved–I didn’t know they paid so much attention to the menu plans, but my daughter commented on how weird it has been not having a menu the other day. We’ve been eating late (see: indecision), and we ate out a bit more than normal. We didn’t go out a lot, but we did go to a restaurant one Wednesday for dinner, and my daughter thought that was just weird – “Who goes out to dinner on a Wednesday?” she asked. I guess I am teaching them good things about eating at home after all. As always, many more menu ideas can be found at orgjunkie.com. We had an eventful weekend. My daughter had a car accident, and the important thing is that no one was hurt. On the other hand, the minivan was pretty damaged, and it is old enough to not be worth repairing–the thing is only worth about $1000, and I would be shocked if we could get it repaired for twice that. 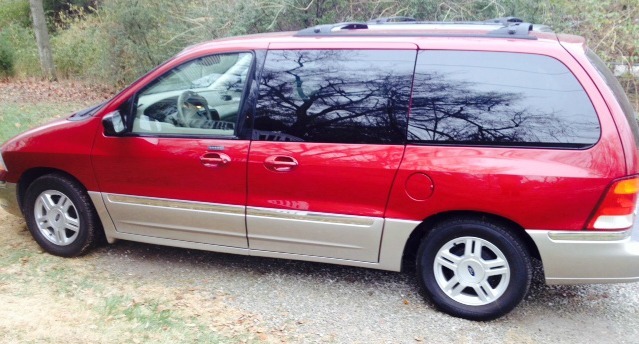 Luckily, my brother sells cars and he found the perfect replacement vehicle for us It is another Ford Windstar, 3 years newer than the old one, and it didn’t cost very much! Isn’t it pretty? The power doors and the heater work! The back windshield wiper works! Hmm, maybe I needed a new van anyway…. Now we are ready for a nice uneventful week (hopefully! ), and we are not looking to spend any money for a while. We stocked up at Costco right before this started, so we should be in good shape. We are getting back to eating at the dinner table every night–we used to be so good about that, but lately we are struggling a bit. It does make the evenings go better, and limits the amount of TV we watch, though, so I am keeping at it. As always, you can find a lot more ideas on orgjunkie.com. Does it seem fair that we have to make dinner the rest of the week during Thanksgiving week? I have desserts to make ahead! I don’t have time for dinners. On the other hand, I want the desserts to make it until the actual Thanksgiving day, so I guess we need to eat other food in the meantime. Are you a baseball fan? I am, and what’s more, I am a Cardinals fan, and this World Series is killing me. The Cards have been so great all season, this series is not going the way it should! Of course, the Red Sox are pretty good, too, and these are hard fought games, so I can’t get too upset, I guess. All of this baseball is cutting into my cooking and planning time. I guess the benefit of posting my menus late is that I know at least some of it is absolutely right. We usually eat pretty much what is on the menu, although we switch nights a lot, but sometimes things just change. It is still good to plan, though–it keeps me in the mindset of eating at home. I’ve said it before–I don’t know why I have such a hard time getting back into the school routine each fall. It’s not like I haven’t done it before–my daughter is a sophomore, so this is her 11th year at regular school. And it’s not like I just sit around all summer doing nothing. But I still struggle a bit with the transition to all the volunteering and homework and coordination. I think that last thing is my problem–I don’t have as much planning to do over the summer. My brain gets a little break from thinking ahead each day, getting everyone where they are supposed to be. It is nice, but then I feel overwhelmed when we get back into it. I do really well the first few weeks of school, then I just get tired. 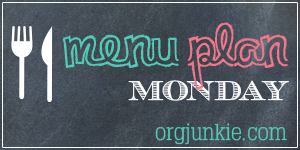 Last week I started a menu on Monday, and I just kind of tweaked it all week. I did cook at home most of the week, so I want to keep track of what we had for future planning. And, yes, I know that it isn’t Monday anymore, but I am not changing my post name–I did most of this yesterday! LOL. These came from the new Gordon Food Service by my house. This was so good! We have a lot of eggplant in the garden this year, which is a bit odd, because the first two years, we didn’t get anything despite planting several seeds. The kids are not huge fans of eggplant, but I am, and it was perfect with the beef and marinara sauce. I know, super gourmet, right? I was trying to get out the door to evening activities. Again with the running out the door. This was actually pre-cooked meat from the grocery store, but I still count it as a win–buying pre-cooked meals at the grocery store is more expensive than buying raw and cooking from scratch, but it is way less expensive than eating at a restaurant. This is my attempt to replace the beloved salmon noodle casserole, which is one of my kids favorite meals. I could make that for them and something else for me, but I love it too. This was really tasty, but it needs a bit of work before I post the recipe–I used too much chicken broth for instance, so it was more like soup than casserole. Tuesday: Hamburger, avocado, salad – are you noticing a trend on my busy nights? I started to plan ahead this week, but I didn’t really make it. I think we did pretty well on eating, though, so I want to document what we did eat for future reference. Also, I broke out the measuring tape earlier in the week. Wow, was I surprised at the results! In two weeks, I went down in size in nearly every category, starting with a full inch in the waist! For some reason, I went up half an inch in the hips, which makes me think I must have done that measurement wrong to begin with, but overall I lost over 5 inches (bicep, forearm, thigh, calf, waist, neck and chest). Again, I have to say wow! Oh, and I did a non-fasting cholesterol test at the end of last week–overall cholesterol is only 130, with triglycerides at 75. My HDL is a little low, but I am hoping to turn that around soon. I am amazed my numbers were so low after eating high fat and low carb for over two weeks, though! I ate bacon, eggs and cheese for breakfast about three hours before that blood draw, too. I didn’t exactly follow my menu the week before because things got a little busy, but I did pretty well and I was happier with what I was eating. Tuesday I ate leftovers instead of cooking, and Wedesday I ended up with only 30 minutes at home before I had to run out the door, so I ended up eating hard salami and pickles, but overall the better planning really helped me this week. I found the food less boring, and I spent a little less money. I have to say, the change I am having trouble adjusting to is keeping enough meet and especially eggs on hand! We have been eating a lot more eggs for breakfast, and it doesn’t take long to go through a dozen eggs with 3 people eating them. My monthly Costco run is going to look a bit different this time than it has in the past, although I have been getting more meat for a while now–it is just such a good deal to get meat there rather than the grocery store. Sunday: I had the boy only after the Boy Scout camporee, so we went on a mother/son date at Bandana’s. I had beef and pork, with green beans and cole slaw. Thursday: Last day of school, so we had to work around the end of year party. We ate some leftovers before heading to the party, then the boy went and had pizza with his friends (the girl was off with her dad), and I went out for a burger topped with shrimp and a cajun spice butter sauce with no bun and cole slaw on the side. I also had a few hot wings after we confirmed that there was no breading on the wings. Friday: This time I had the girl and one of her friends while the boy was off at his dad’s. We went to a local Chinese buffet place that has crablegs on Friday nights, dipped in delicious butter. I had salmon, a bit of roast beef, green beans and butter mushrooms, too, along with a chicken skewer and one BBQ rib. All in all, still a bit too much eating out, but I think it is getting better. The girl and I really liked the cauli-rice, but the boy was not impressed. I think it might be better for him as a base for other dishes, but he is just not a cauliflower fan. The kids are both off to their dad’s now until Friday, when they will come home to help pack and get ready to head out on vacation on Saturday. I need to do some planning ahead for myself this week and for the food we are taking for the first part of the trip, which will be a couple of days of camping. I am thinking it might be good to head to Costco today, too.